Acer is finally ready to pull back the curtain on the Iconia Tab A700 tablet. The A700 runs on a quad-core Nvidia Tegra 3 processor, 1GB of RAM, and Android's lastest OS - Ice Cream Sandwich. Built for media playback, the A700 crams a 1920 x 1200 resolution onto a 10.1-inch display for full HD 1080p quality. To complete the experience, it also features Dolby Mobile 3 audio with the capability for 5.1-channel surround sound. To round out the hardware package it includes 32GB of flash memory, a micro SD reader supporting cards up to 64GB, micro HDMI port, micro USB 2.0, 5-megapixel rear-facing camera, and a 1-megapixel front camera. The 9800 mAh battery can get a purported 10.5 hours of life for video, 8 hours with web browsing. The Acer Iconia Tab A700 hasn't changed much since we saw it last at CES 2012 early in the year. In our hands-on, we were impressed with the HD 1080p display, a first for Acer tablets. The tablet's outside design was less impressive at the time, bearing the functional casing typical of Acer's devices. That seems to have changed slightly for the final model, with a textured soft touch exterior in either black or silver. It isn't exactly the thinnest tablet, measuring in at 10.9mm thick and 1.42 lbs. 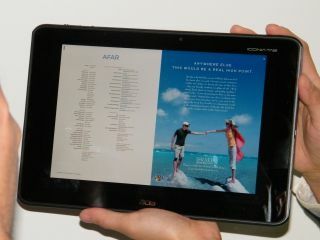 The Acer Iconia Tab A700 will set you back $449.99, which isn't bad for gorgeous display, with pre-sales starting today.